Many people who download a file with the extension MKV will often try to play it back on iPad, but iPad doesn't recognize the file? Well, the first thing you must get some knowledge on MKV. MKV, also known as Matroska, is a multimedia container format. It is another container format that similar to AVI. It is an open source container that houses an unlimited amount of video, audio, and even subtitles data in a single file. MKV files contain video and audio streams (may also contain subtitles). The streams are likely compressed and have been produced with an encoder. In order to play these streams a codec is required. Codec, as a word is an abbreviation of Coder/Decoder. The video stream located in the MKV file has been "coded" by the source and now it must be "decoded" by the end user who wishes to play it. Now, you must want to ask the question, "How can I watch videos in MKV format on iPad for Mac?" 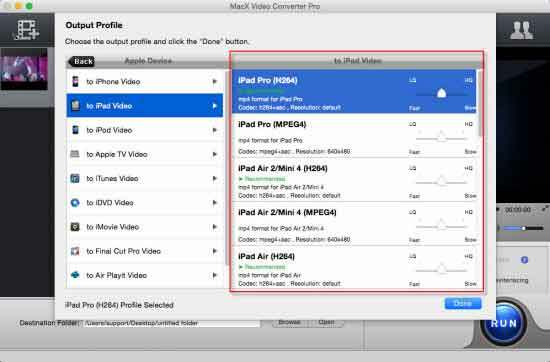 The answer is easy, you just need a profession video converter to change your MKV videos to right iPad mp4 on Mac OS. MacX Video Converter Pro is a versatile video processing software which helps you convert MKV to iPad, MKV to H.264, MKV to H265/HEVC, with the fastest speed (by taking advantage of Intel's Sync Quick Video/Nvidia/AMD acceleration tech) without quality loss. Then you can easily import/put MKV file to iPad Pro/Air 2/mini 4 etc for playback anytime anywhere. Best MKV video transcoder to decode MKV, MP4, MTS, AVI and more to iPad (iPad Pro/mini 4/Air 2 etc) supported formats with world's fastest speed and no quality loss. After free download the MKV to iPad converter (macOS Mojave supported) or the Windows version for PC (Windows 10 incl.) install and launch it. Then click "Add Files" to add your MKV video. Select the output video you desire. Under "to Apple" category, you may choose "to iPad" as output format. After finish the above steps, click the "RUN" button to start MKV video file to iPad conversion, you could view the progress and are able to cancel it at anytime. To get the MKV video onto your iPad, launch iTunes. Drag your new converted movie file into your iTunes library in the folder or playlist of your choosing. Attach your iPad to your computer and sync the iPad with iTunes. After the syncing is done, then you can watch MKV video on your iPad and take the movie with you. Certainly, the aforementioned tool provides you the simplest way to convert MKV to iPad on Mac. In fact, you can apply another iPad video transfer - MacX MediaTrans to directly move MKV video from Mac (macOS Mojave) to iPad Pro/Air 2/Mini 4 since it can automatically transcode MKV to iPad supported video format during the transferring process. World's fastest transferring speed and no quality loss. Ahead of MKV video transfer, you should download this MKV file to iPad video transfer on your Mac computer (MacBook Air/Pro or iMac 4K/5K). Step 1: Launch this iPad video transfer and connect your iPad to Mac with a USB cable. Step 2: Tap "Video" icon on the main interface to check your iPad videos on Mac. Step 3: Hit "Add Video" button to add MKV videos from Mac to iPad. Step 4: Click "Convert" button to convert MKV video to iPad when this iPad transfer notice you "Unsupported format" message. Finally, press "Sync" button on the lower right corner to import MKV videos to iPad. BTW, this professional MKV video transfer software can also move video to iPhone iPod for free enjoyment on the move. MacX Video Converter Pro provides the fastest MP4 to iPad Air conversion process for you Mac. Read the guide to transcode MP4 video to iPad Air readable format with high quality. Want to play MKV files on iPad mini with Retina display but MKV is unrecognized? MacX Video Converter Pro can easily and quickly convert MKV video to iPad mini Retina friendly formats for smoothly playback. Do you want to convert video for playback on iPad tablet? This article shares 3 best video processing tools for iPad and tells you how to decode and encode FLV AVI MKV M2TS to iPad (iPad 4/3/2, iPad Mini with Retina, iPad Air/2) viewable format easily with the best iPad video converter software.